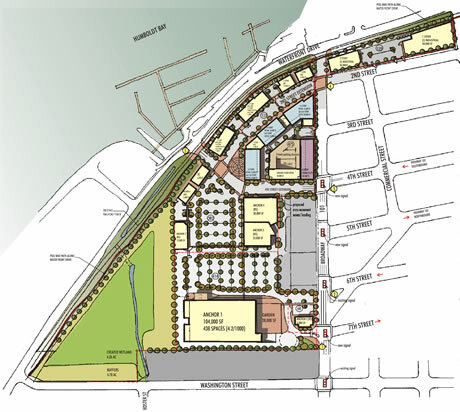 Marina Center will establish an 11-acre coastal wetland preserve at Clark Slough, resulting in a publicly accessible environmental feature covering nearly a third of the total development. The environmental preserve will include restoration of a major portion of the historic Clark Slough wetlands. The initiative will add to Eureka’s public access open space and will restore the area to a natural condition it has not known for 100 years or more. Marina Center will transform the Balloon Track area, a long-abandoned eyesore that has become a magnet for drugs, vagrancy and crime. 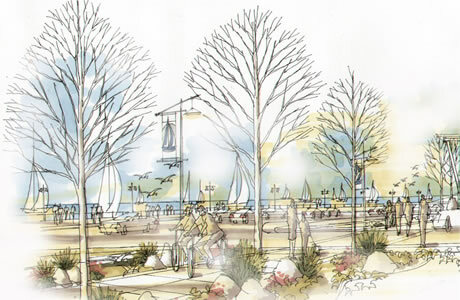 Community access to Marina Center’s Clark Slough wetlands habitat (currently prohibited by law) will include a perimeter walkway or boardwalk with a kiosk and interpretive signage at vantage points along the path pointing out opportunities to see wildlife or examples of native plants. This pedestrian trail will connect with a pedestrian/bike trail along the existing railroad right of way, which will in turn connect Marina Center with downtown Eureka. More than 1,000 jobs will be created with Marina Center’s mix of office, retail and light industrial employment opportunities. The project will also create much needed service-sector jobs (such as security, landscaping, janitorial and maintenance, etc.) All of these jobs, in turn, will support other local jobs through the spending of workers' wages. Development of the Balloon Track will revive it as a contributing and useful part of Eureka, resulting in a boost for the local economy and revitalization of the area south of Old Town.